PHILADELPHIA, Feb. 22 /CSRwire/ - (Marketwire) - The Justice Conference – Trade as One (http://tradeasone.com), a company that makes it easy for consumers to build ethical products into their lifestyles, is launching its one-of-a-kind fair trade food subscription service today. Designed to make it convenient for today's busy consumers to buy ethically, Trade as One's service delivers a box of healthy, natural, fairly traded products to peoples' door. This is a simple way to transform the lives of the poor as every item in the curated selection is produced by people in marginalized situations, both domestically and abroad. Delivered every three months, the box contains twelve to fifteen fairly traded consumables – all full size. 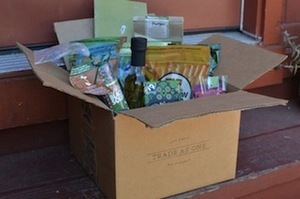 Each season's curated box is unique and will typically include staples such as rice and quinoa, kitchen essentials such as olive oil and spices, as well as unique baking mixes and luxuries such as chocolate. A body care item is often included as well, such as shea butter soap, or coconut oil lotion. Paul Rice, President and CEO, Fair Trade USA, commented, "American consumers have so much power, and they want to use that power for good. Trade as One's new Fair Trade subscription program makes it easy for shoppers to make a difference with their dollar. It also makes Fair Trade accessible to all – beyond what local stores may offer. I see tremendous opportunity for this initiative to increase the availability of Fair Trade in the marketplace. Increased availability for consumers means deeper impact for farmers and workers across the globe." Trade as One connects people's conscience with their purchasing behavior by making it meaningful, fun, and convenient to build ethical products into their lifestyle. By connecting poor farmers and artisans with American consumers, Trade as One offers people more power to change the world, but not through charity. Instead, it offers a quarterly delivery of fair trade products that provide dignified jobs to people who would otherwise be marginalized and living in severe poverty. The company was founded by Nathan George seven years ago and is headquartered in Santa Cruz, California. For more information, visit http://tradeasone.com. Video about the Trade as One subscription service is here: http://vimeo.com/60202296. Trade as One - Our Subscription from Trade as One on Vimeo.